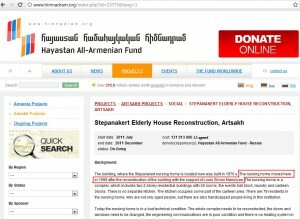 A few days ago the cost of the “Stepanakert Elderly House Reconstruction,” an ongoing project of “Hayastan” All-Armenian Fund (HAAF), increased by 265%. 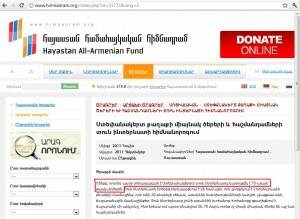 This dramatic increase from about $400 thousand as of October 2011 to about $1 million as of November 2011 was accompanied by the addition of the Artsakh government as a co-sponsor of the project. Thus, the allegedly cash-strapped Artsakh government has committed to investing $600,000 to an already overvalued project. Over a month ago I published How to Renovate Already Renovated Retirement Home, an article about the redundancy of certain aspects of that project and the cost exaggeration. I had also pinpointed the indecency of the HAAF for providing false information about the history of the retirement home. At that time they claimed the building in question had not undergone major reconstruction since 1988, whereas it is a fact that Louise Manoogian Simone funded a major makeover in 1999, costing about $400 thousand. The sad fact is that out of all the shortcomings presented in How to Renovate Already Renovated Retirement Home, the leadership of the HAAF paid attention to only one mistake: the failure to mention the more recent renovation in 1999 by Louise Manoogian Simone. The criticism over exorbitant expenses of the project was ignored completely. HAAF and the government also ignored my indication, in How to Renovate Already Renovated Retirement Home, of some vital commitments abandoned by the government due to lack of funds, such as the governmental plan to demolish the dilapidated rat-infested apartment buildings in Stepanakert and replace them with modern housing structures for people living there. 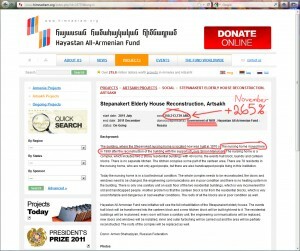 Instead of making a wise redistribution of state funds, the authorities of Artsakh preferred to increase the cost of the dubious project of renovation of the retirement home by $600,000. Yet that same government is too stingy to invest a mere $6,000 to secure a sufficient supply of the life-saving antivenom for the Kashatagh region. A bottle of this vital remedy costs AMD 72,000 (about $200). This entire region reportedly has only one bottle of antivenom serum, and it is in Berdzor, the capital of the region. In the meantime, 29 locations of strategic importance in Kashatagh need at least a bottle each. Under the current circumstances, the only way to save people’s lives in the event of a venomous snake bite is to keep them immobile until they arrive at the clinic in the town of Berdzor, which is almost impossible to do on a trip that can take up to two hours over bumpy roads full of potholes. Ara K. Manoogian is a human rights activist representing the Shahan Natalie Family Foundation in Artsakh and Armenia; a Fellow of the Washington-based Policy Forum Armenia (PFA); creator of www.thetruthmustbetold.com and author of the white paper “To Donate Or Not To Donation”, an in depth study on the activities of the “Hayastan” All-Armenian Fund.